The impending closing of Donna has bumped a couple of thoughts to blog to the front of the queue. First off, Donna is an iOS calendaring app that focusses on one’s agenda for that day and upcoming days with a targetted focus on the transportation timing and how that impacts your day. If your life has children that need transporting between activities or work that is out and about bouncing to meetings or work sites Donna is utterly indespensable. Donna puts a focus on the getting between places, so calculates the travel time to let you know when you really should leave, as it monitors traffic and weather conditions. The app offers four different modes of transportation and the related times for those: Driving, public transit, biking, and walking. One of the best parts of Donna, which many other applications also do, is it reads your native calendar on iOS and augments it. It isn’t a separate calendar to lose things in if you forget. Content you may modify to help plan in Donna, like search to find the exact location for a meeting, is added to the calendar object and can be used in other calendar apps. I will focus a bit more on this in the following section on “Small Apps Loosely Joined”. Not only will Donna give you a warning when it is approching time to leave, but it can send those you are meeting with notification that you are on your way and / or you are running late. Donna also monitors the weather and can advise on transportation changes should you be walking or biking. One other really helpful element is having the option to use Uber, if you are in a city that has it (Donna knows) and the event is that day (this was incredibly helpful this week). One of the wonderful things is the evening of the day prior Donna provides a notification of how many meetings you have the next day, but if you don’t have any in your calendar(s) it tells you to enjoy your day, which is a wonderful little touch. The thing that stands out with Donna is not just its really good interaction design and really well designed information structures for easy to scan appointments, but it is designed to solve a pain point. Most specifically it is designed for use. The design is focussed on solving a problem and to be an easy to use solution for that problem, which is: I have meetings and activities in my day that take me out and around and sorting out the timing so I can optimize my day for my interests (get more time by driving, more health and environmentally focusse using bike or walking, etc.). Letting others knwo when you are late or on your way is really helpful and directly tied to the mobility of getting to meetings and activities. Having an app that pulls all the needed information around that task set is fantastic. Donna isn’t designed to be a full replacement for a calendar, but is there to augment it and the use needs around the activities of getting between places. Donna also understands what is needed as well as not needed. Allowing for modifying settings for alerts and notifications is really helpful. Understanding when alarms are not going to be helpful, understanding helpful user preferences when you are running late (auto send notes, how far ahead, or not to send at all automatically). Donna was built with the idea of a really helpful human assistant who looks after your schedule and is a step ahead of you. This framing of use and a helpful model really shines through in the app. Donna and many other calendar apps that are on mobile devices are not aimed at fully augmenting your native calendar service, but to integrate and augment that service. The model that is increasingly familiar is along the idea of small apps loosely joined model. This model puts a focus on using standard data structures, common object types, and a central app or service as a hub to provide a foundation for other apps and services to use the core object and augment it, often with data that fits the model type, and exends use. With Donna the object is a standard calendar entry that has day, time, timezone, location, who are meeting with, notes, etc. But, the app can improve the data in the object, such as location. But, most of the apps not only improve the information within itself, but improve the core data so all other apps that use that object as well. The apps are often offering agency to do a task, or set of tasks, around the object. Donna puts the use focus on the use needs for getting there and communicating with others around that activity. With calendaring, many using Mac or iOS opt for Fantastical to imput new calendar items as its native language parsing into a calendar data structure is incredibly good. Some people really like the interface from Fantastical and use it to view their day and upcoming events. There are an incredible amount of viewing your calendar / schedule options out there. Another smart agent for the calendar is Tempo app, which works to aggregate everything around a calendar item and pull it into easy reach (very much in the Come to Me Web model). Tempo pulls all the contact information for all participants in a meeting, all related email, all related files, weather, etc. all within easy reach as part of its view of the calendar entry. Tempo is as indespensable as Donna is for me personally (and I heavily rely on Fantastical for easy input, on my mobile I talk the calendar entry info into Fantastical and let it do its thing). Who is Living the Small Apps Loosely Joined Life? So who is working this way? Not so surprisingly, if one has been paying attention to how people actually are using devices and services, the user survey’s the past year or so have been asking about using more than one app for task types (calendaring, notes, reminders, text, etc.) and finding that 60% to upper 70% of those surveyed are using multiple apps for task types. Those surveyed have often been well outside of the geek and nerd camps that have worked this way for years, but regular folks who are not deeply adept technically. The focus on apps that do a task or set of tasks insanely well and easily trump a large app that does many things somewhat well. That one size fits all and category winner thinking has been dead for quite a while and is far from helpful model for thinking about much of anything. The last few years, either in conferasions or listening to them, with people talking about their apps and how they do things on the devices (often mobile and tablet) it is increasingly common to hear, “I use a few apps to do…” what follows is calendaring, text documents, notes, mapping, driving directions, reminders, etc. and two or more apps stated and the specific tasks and user flow they have for each app. These were often non-geeks, but having surveys targeted at mainstream users and their habits and use patterns really brought home how mainstream this actually is. As Harry McCracken pointed out in Yahoo to Donna Users: We’re Dispensing With Your Indispensable App Donna has become indispensable for me. The great folks at Incredible Labs (that includes bud Kevin Cheng) did a fantastic job with Donna. Keeping Donna going was likely going to be a struggle as the computing to suss out location and needs as well as the and licensing the transportation times they used was not going to live a long time as an ongoing free app. The competition with other apps starting to incorporate similar time for transit models (yet clearly not designed from a perspective of use, but as a feature to add) likely was going to make things tougher as well as Apple adding transporation times and notifications based on that in Mac’s Mavericks version (adding it to desktop OS and not the mobile OS really was an odd move that is very un-Apple as it was not designed from a use in mind perspective). It has been a while that I have been worried about the long run for Donna. A chat with Kevin about running a start-up in this space somewhat gave legs to that concern. Many start-ups have an exit in mind from the start and with any luck and perseverence it is a positive exit (not just shutting it and going bankrupt). I am really happy for Kevin and the other Incredible Labs folks as they got a positive exit for them and I wish them well at Yahoo (for all that are making that transition). Incredible proved they could nail a service that is designed for use, which leads to it becoming a really valueable part of people’s lives. Thank your for bringing us Donna as an agent to greatly improve our lives. I'm not so sure that Carl's broken decade got better in the first half of the 2000 decade, but it really started to. We are much farther along now. Our consumer world started to improve quite a bit and slowly business systems and services are slowly improving. The initial part of Carl's rant focusses on the number of steps to get something going. Once it is working the steps are still clunky. Carl gets in a great rant about time and how broken it was in the 90s within technology (calendaring and syncing is still a beast and likely to for a bit longer - you understand the problem sets and pain points if you have ever tried to build syncing). With calendaring and its related activities we now have Tempo, which is freakishly close to the next step scenario I used in many of the Come to Me Web presentations and Personal InfoCloud presentations from 2003 through 2007 (I've been getting requests to represent them as this is what more and more developers and designers are dealing with today and need to have a better foundation to think through them). There was an internal Yahoo presentation (and follow on day of deep discussions and conversations) with a version of the Personal InfoCloud and Come to me Web flow that is nearly identical to the Tempo app video scenario and ones spelled out in Robert Scoble's interview with Tempo CEO, which is utterly awesome that it is getting built out some 10 years later (we had the technology and tools to do this in 2004 and beyond). Carl's rant gets worn away over time though consumer devices, services, and applications. The refocus on ease of use and particularly the use through mobile, which requires a very different way of thinking and considering things. It thinking through design, the dependancies, and real user needs (all while keeping in mind the attention issues, screen size, networking, and device limitations). The past couple years mobile finally caught on with mainstream users and people doing real work on the mobile and tablets - Box 40% mobile access of files stored there over the last couple years. Many other business vendors have had mobile use rates of their services from mobile over the past two years. When talking to users they opt for mobile solutions over their full enterprise tools as they are much easier to use, which quickly translates into getting more work done. As Bernd Christiansen of Citrix stated in an onstage interview the employee's most productive part of the day is often the walk from their car to the front door of the office working on their mobile devices. This world is not fully better and fully easy to use from the days of Carl's rant, but it is getting better. We still have quite a ways to go. Like many people, I struggle with a large amount of inbound information that has potential value today, but also value to myself and to others down the road. Being able to sift through the information and manage what is needed today, as well as keep potential future needs close at hand, is essential. A few approaches have helped me over the years, but a mix of personal practices and tools help keep some of this in check. My practice started with a rather healthy RSS feed many years back where I followed 400 or so feeds. The daily new items in the feeds numbered well over 1,000. But in that flood, I found items of great value that I was not finding elsewhere, and that value still continues today. Those nuggets help me to be better informed for work, but also provide a solid repository for understanding and writing about the world around me. The process still requires me to see things; it is a "who and what" pass through the information. I learned very quickly not to really read things on first pass, but to look at headlines of the individual feed items, and anything of remote interest gets opened into a Web browser with tabs. Paying attention to the source of the information, as well as to the headline, helps decide whether something gets opened in a browser tab, because certain people continually provide solid information that is worthy of attention. The first pass may have identified 60 to 70 items out of 1,000 potential ones. That step often takes 20 to 30 minutes, which indicates the depth of the review. I found I could perform that portion of the process much more quickly in a desktop feed reader than an online reader because I could optimize the typeface size and only see headers, which allowed a view of 50 to 100 unread headers at a time to quickly skim through. Much of that was done on a Mac using NetNewswire. After I have gone through all of the items in the inbound queue and things of potential value, I move onto a slightly deeper scan than just looking at the headlines. This pass assesses potential value and is a quick read of the first paragraph or scan of the whole piece to quickly assess if there is any value. If not, the tab is closed and I move on to the next item and skim it. At the end of this, I have removed duplicates and things that were not of interest or foreseen value, often in 10 minutes or so. The last step is to go back to the remaining items (usually 10 items or so, with some days only one or two and others 30) in their open tabs and read them in more depth for current needs. Items that have current value I leave open. I will come back to them after I manage those with future value. I read the items with current value closely, summarize and add them to a work social bookmarking tool, as well as to a Web social bookmarking provider (if it is relevant and prudent). I don't read as closely the items with future value, but I add them to a social bookmarking site, like Delicious, Diigo, or Pinboard (as well as to any work-related service), and tag them for my own context and others' needs, tie them to future needs as much as possible, and summarize them. I may also add those items to Instapaper to read at my leisure. One nice benefit of Instapaper and Pinboard is that they work together. As I find things I want to read in depth in Instapaper, it will put the link into Pinboard as to-read, if you have the two services and accounts connected. That connection makes it relatively easy to update in Pinboard to add tags to put your context on it and a summary. I also can view the "from Instapaper" tagged items and read those I have not read, which have a tag "mark as read," if I have not read them in Instapaper. This interwoven system is just one slice of keeping on top of the information that streams past us. As it is with many things these days, staying on top of the inbound information is essential. This approach is one of many options, but can make a good dent on staying current and informed today and tomorrow. Things have been a bit quiet here, but many changes on this side of the screen are settling and allowing idea and writing focus. One of the things I am pulling together are my columns from KM World on Personal Knowledge Management (it unintentionally went into hiatus at the same time). One of the great things about writing for KM World was after a set time I have the rights to my own writing to do with as I wish. Also, those of you interested in the Social Lenses I have a half day workshop offered on April 3, 2013 in Baltimore at the IA Summit Workshop: Using social lenses to see social dimensions. The only way beyond our current less than optimal state of social software and service offerings is to see it differently, distinctly, and more deeply. This was written in April 2011 and a publication had interest in publishing it, but it didn't fit their editorial cycle so it sat. I have annotated this with an endnote to bring it current. A funny thing happened on the way to the next big thing, the big thing was little. Many people are looking to build the next Facebook or Twitter, but those that are gaining traction and actually being used don’t focus on collection and aggregation of the masses, they focus on the small groups of people who know each other and really aren’t connecting or interacting in or for the public eye. At SXSW this past year, 2011, the next big thing wasn't one thing, it was many things. It was these same smaller group interaction platforms that let people who know each other already interact. The funny thing is this really shouldn't be a surprise to anybody who has actually been following or connecting to the mainstream in the crowd using Facebook or any other large service. Most people are are connected to a small group friends or other label for the people they share information, status, and possibly location with. When Facebook took its service beyond the walls of the university and let any old Joe and Jane in many of the students had fear and cut back their usage of the service. They wanted a service to have more regular communication and more private interactions with out of the eye of the hoards. This isn't because they are doing things they are ashamed of or would cause them consternation if others found out, it is because that is how most people in mainstream interact and consider normal. Many of these students kept their Facebook accounts and use them occasionally, but this is not their social home, this is not where they check the pulse of the group of people they want to connect with. When you consider how this plays out you see it really clearly inside organizations that have openly social communication and collaboration platforms up and running. Much of the interaction is often not out in the open, but in the more focussed less travelled (or even semi-closed) groups and forums. These are the comfortable spaces with permeable walls. But, this is often where much of the sharing and interacting happens in organizations. For many who drank the Kool Aide of people want to be openly social, this is an odd trend. But, it isn't really a trend it is the norm and for most of time going back this has been the norm. There is something to Robin Dunbar's postulation of “theoretical cognitive limit to the number of people with whom one can maintain stable social relationships”, which is commonly known as “The Dunbar Number” and is approximately 150 (with bounds of 100 to 230 as reasonable lower and upper reaches for most people). But, for small very close knit groupings of friends you often see from a a few teens in groups up to 40 to 50. But, about 40 to 75 the dynamics shift and is repeatedly comes up when talking to people in digital services with the number of people where the service shifted from being fun and easy to use to being more work. This past week I caught Chris Heathcote's presentation on “Invisible Communities” from February 2011 at Lift Conference. Chris talks about all of the unseen communities on the internet and web, which have nearly always been there and keep growing. These are the web forums where the “good” information is shared. These are the handled application based services, some with web presence, but very few are searchable or open to the public. Chris' talk echoed most everything I hear when I talk to the famed “millennials” in organizations who are claimed to be “openly social” and heavy users of these huge web social tools, but when I sit with them in organizations regarding social tools inside the organization (they are included as they are supposed to be the heavy users and the ones that really know this stuff well), but dang if I have ever run across one that has claimed this. Very few use Facebook or Twitter (the “Twitter is for old people” (over 25) is commonly stated) and they all state some different small social tool where they keep in touch with their good friends with. Doc Searls wrote a real gem of a post, “The Sense of Bewronging”. Doc's post is about the need for personalization and putting things in context that “I” care about, or as talked about here in this site the Come to Me Web and Personal InfoCloud. A post that triggered Doc was a presentation and post by Louis Gray “The Third Wave of the Web Will Be Uniquely Personal”. Both of these posts talk about aggregating all that we have inbound and as well share out (our digital exhaust) so to filter and hone what it is we care about so to serve it up more to our actual interests and with out information overload. All of this matters because for as much as we use ThinkUp, My6sense, Momento app, Summify, etc. for our aggregation of personal exhaust data and to filter to ease our attention focus as well as use and most importantly reuse what flows through this at some point. In using these services most are focussing on the big social stops like Facebook and Twitter, just like malls have big box stores, but most people are not going to the mall for the big box they are hitting the smaller stores or skipping the mall altogether for more personal customer service and supporting businesses of people whom they know. If the social aggregation and information filtering tools are keeping their focus on the mall’s big boxes of social web, they are missing where many people are actually spending their valued attention. Having a wonderful service like ThinkUp to provide a history of what I have shared and was shared with me (or the more impersonal fact, shared to many and my friend hooks, nabbed a digital copy of that sucker) so that I can search and pull things together later is missing some key valued elements. While it is worth the time these services are spending (all pulling the same big sites and services and missing the less broadly known services) on the big box social web services, so we can pay a bit less attention on them but for some digests and pay attention to our more valued services. But, what looses out is the use and reuse of across all those services. You have a friend share a book she just finished she thinks you and your group would like, but shared it in your tight friend space you won’t have easy recall from a central place. A real personal aggregation and attention management tool needs to capture all streams we consider to have value. Being able to build a Granular Social Network that really works and that keeps our attention from being over taxed is where much of this really should head. We have been stating what this third wave of the web should be for a long time as a personal web, we now have the tools start getting there, but we need to ensure our focus fits our needs and our actual interactions. Yes, for those of you that have made it this far and have been waiting to state all this is walling ourselves off from the rest of the world, well I think this aggregation, archiving, and filtering to keep our attention from hitting overload is needed so we can take a much broader look at what is outside our bounds. If we enable keeping what is valuable in front of us we can explore and interact even more. Some things have changed a little bit in the past year, but largely not much has changed. Facebook has its Timeline, which has thin value for being able to scan the real volume of our activities and then be able to aggregate and reuse that information in more usable and valuable (for one's self and others) format. It is an interesting visualization, but the value of making deeper sense just isn't there and understanding things never seems to fit in Facebook's plans. Lately, I've been getting asked what I am working on beyond client work, as there have been things popping up here and there that hint something is brewing. Well, there is and there isn’t something new, but something (one of my things has been drawing my attention). It started in Summer or early Fall 2010 with a blow off comment from me to someone else who was stating how difficult working with 3D was, and I blurted something like “try social software, which is 6D or 7D or more”. That was tweeted as an overheard (OH) and people started asking what the 6D or 7D were. At the time I blurted it I could roughly name six of seven different dimensions of social interaction that needed to be considered and design for. But, with each stating of the six or seven, the list started growing. This list of six of seven dimensions were coming from the frameworks, models, and lessons learned I have picked up since 1996 working with social software inside organizations and out on the web. By late October I was finally putting these social elements I used into a list, which quickly was into 20 high-level items and by November was about 40 items. I was also fleshing out the list for each item. I started calling the list my “40 Plus Social Elements”, but recently I have changed it to “40 Plus Social Lenses” as that is a much better term for how I have been using them over the past 15 years to see the “it depends” inflection points and enable thinking through them. Nearly every organization I talk to (or even web start-up working for on social interactions) I talk to is getting stuck or is hitting things they hadn’t expected a few months into their use with these tools. It does not matter if it is a platform improve internal communications and collaboration, a social CRM program, and/or a social media (marketing) effort everybody seems to be running into issues they did not see coming. Often I will start by asking how they are dealing with something (based on program type and tools) and I hear, “How did you know we had this problem? Who did you talk to?” They affirm they have these issues, some are manageable and at times they are really problematic. But, the big question is why did they not know these issues could arrive or would potentially arise. I have kept these lenses separate for years, rather than building into one big approach as each organization or services is different enough and has different enough influences that it is really tough to have one big singular approach. Taking small steps, monitoring, and then adapting or iterating is a really helpful approach, but so are mixing and matching lenses to get an improved perspective. Building solutions that address needs and having an overall big vision are helpful. Most often with social tools is it a more connected and free flowing means of doing things. The continual problem for anybody who has been responsible for long-term management of social systems and/or communities who use them, development, design, and/or iteration of social software solutions is painfully confronted with, “is what I am seeing happen (often framed as a problem or issue to be solved) an issue with individual people, how humans are social, the culture(s) where the system is being used, the organization's needs and requirements or structure, or the tools themselves that are being used?” Often the answer is “yes”. These personal, social, organizational, and tools issues all interweave and quickly create a complicated, if not complex system where isolation of individual elements is really difficult. There is also a counterweight to this, which is we know that for use and adoption of these tools and services they need to be simple to use and get started (it doesn't mean they need to stay that way, Lithium's Community Platform is wonderful proof of this model and a I really need to devote a piece to why as it isn't plainly seen by most). This thinking really started jelling in 2004 at Design Engaged with Mike Kuniavsky's lead-off monologue on complexity, which in his 10 minutes he focussed on the complexity in interaction design and urged us to “run toward the light of complexity”. This is an essential understanding for interaction design as the designer is working to make things that are rather complicated yet rather simple to use, which requires the designer to embrace the complicated and complex to master it so to work to make it simple. Where interaction design hits the individuals and their interaction with systems, social interaction design adds more layers with people interacting with others through the tools, which can be rather complicated just on its own and now you are throwing software in the middle. In 2007 or so I hit another big wake up call. I was working on the folksonomy book (no, it didn't get published, nor finished being written) and a couple months in I hit a sticking point. What I found was many of the common social models and foundations for Web 2.0 couldn’t explain the strong value that people were finding in places where Web 2.0 thinking would not lead one to believe it existed, nor could it explain the problems that I was repeatedly seeing. It took 12 or more months of deconstructing and reassembling the Web 2.0 models, the lessons I learned from years working with and building social software, as well as my formal education (in communication theory, organizational communication, grad school with economics, and social analytics) to identify the variables and components that had value and then build frameworks for thinking how this worked and why. I have blogged many of these as well have been presenting them publicly as well as using them in workshops and client engagements. They have proven to be really valuable, with feedback from many that is has saved them tens or hundreds of thousands of dollars in cost avoidance and value derived from improved decisions. What is This List of Lenses? The list is essentially what I have been using and building upon for 15 years dealing with social software and the hurdles and headaches that can come from it. These 40 plus lenses (sometimes nearly 50) are questions, models, and frameworks I use when working with clients or in workshops. I hadn’t realized there were as many elements in the list as I often work conversationally and one answer from a client will trigger 2 or 5 more questions that are relevant based on that answer or insight. This progression gives better understanding not only to me, but also to them to see potential options, the possible benefits as well as possible detractors, and then think through them sanely. Knowing potential problems or issues, helps keep an eye out for them and be prepared, all while using lenses to know that these decisions may bring. I have shared the list with some others with quite long backgrounds in social software on production, management, or research sides and all (well not the researchers) have the first response of, “Thomas, you are over thinking this there is no way there are that many.” But, as they go through the list they often find all of it is very familiar and things they think through and consider as well so to help their organizations, services, or clients. Many of us have built up this trove of tacit knowledge and I'm working on making it more explicit. Where I am finding the list is having value is using the components as lenses to see the “it depends” inflection points and be able to think through them to solid results that match each organization as best as possible. Often there isn’t an optimal solution, but knowing a gap exists and to keep an eye on it has made a huge difference for organizations as well as those building products. The list is still in flux a little but, but it is firming up and getting it organized in to a nice flow will help. Once that is done it is writing time. I have been presenting many of the items on the list in workshops and in client engagements and honing the understanding and getting solid feedback from real experience and use over the years. I have been having many discussions around the list and thinking that is behind them, which has surfaced in Dave Gray's Connected Company and a Gordon Ross’ post on Connected companies, complex systems, and social intranets. There is good thinking and understanding that is needed so we can get more value and better understanding out of social software used in organization and on the web, but importantly it can help the products and services improve as well. What am I Doing with This List? In 2006 I started using this graphic to explain social scaling and functionality around social tagging systems (then the x-axis was “times an object tagged”), as it helped bring to light the reality of what was to come from use. But increasingly I also used it to explain general social software maturation that echoed social software development work I was doing in 2002 and even patterns seen many years earlier in my work with social software. As the number of people using a service increases over time and the number of activities in the system increases over time the system changes drastically. The needs, frameworks, and interactions (both social and services) change drastically. Not understanding what is coming has so many organizations making tool and service choices that have them quite stuck as they try to progress past the second stage. Not only did they not see this coming nor did those whom they paid handsomely to guide them through. Lack of Understanding Begins Where? Much of the lack of understanding with social software today is mistaking what seem like simple Web 2.0 tools and not understanding the depth of thinking and understanding from a technical, interaction design, and deeper understanding from a social science perspective of what is needed. Many Web 2.0 services rarely get into the 3rd stage of “Mature Social Tools”. When you bring this understanding into organizations and their needs for vastly improved communications, social interactions, collaboration, and efficiency needed the Web 2.0 model doesn't really get you far, nor help you prepare for what will come. (It is not that Web 2.0 offerings are not capable, it is that if they are even moderately successful they are dealing with many millions of users and keeping their offerings running with more simple social interactions and needs has them completely occupied). Claiming your tools and services are like Web 2.0 tools and having them actually be rather equal to the lack of depth Web 2.0 products like Facebook have, becomes a pill filled with poison that once swallowed will release over time. The problem is less with to do with Web 2.0, but how things progress within fixed populations beyond the capabilities and needs (limited by volume and scale of resources needed to handle the volume of Web 2.0 services). Think of the fishing industry and the practices needed for fishing at massive industrial scale and optimizing skill of fly fishing and sustainability. Along the y-axis is the number of people participating in the service. As this increases the need for individuals to manage relationships and interactions increases. Along the x-axis are the number activities, which can be: Conversations, media shared, ratings, documents, short and long writings, annotations, organizing (curating) what exists in the system, etc. Optimally the service will have growth that progresses in a relative balance between people participating and activities over time. If the balance has many people and few activities (or range or activities around subjects or tool types, see the differentiation between collective and collaboration, which doesn't include community/group distinct needs) the system will be really narrow and seem like their is little activity or action and perceived value dissipates and the usual result is decreasing visits and use. If the services has a relatively low number of people participating and a lot of activity the outcome is usually a very narrow view and lack of breadth of understandings, which limits the perception of what subject matter or activities types happen there. What Are The Scaling Stages? This stage is firmly set in the simple (a passing or deeper knowledge of Dave Snowden's Cynefin framework will understand the framing help). All social tools and services start their useful existence with personal value. They are offering where people place what they know or see where they can come back to it easily, as well as share with others, who will / may eventually find it. This clarity of understanding the personal impact was really clear when Delicious started. Joshua Porter actually called this the “Delicious Lesson”. The personal also helps initially frame what you have interest in and captures it, provides seeing others to connect with to initial share with and follow, provides a means to hold onto connecting with people, and hopefully allow people to see this in their own contextual lens. There is very little social interaction as things start out. It takes work of planning, engaging, and managing the initial social interactions. Community managers (instigator and evangelists) are essential for helping people into this first stage and get the whole moving toward the next stage. Problematically many services under provide for the needs and capabilities of the personal needs, not only for enabling initial uses, but for more valuable needs as the services mature. Seeing and managing who a person connects with and why along with actions taken in the system (accounting for time, cycles, and patterns) is a real need which helps people not only use the services but see the value they get from it. This second stage still has most of its focus on the simple, but toward the edges of the next stage that shifts. Once the service gets more people using it and the activities increase things move from a heavily personal focus to one that is more social. The social interactions are more serendipitous than planned interactions as people aggregate and interact mostly through stumbling onto are being guided to subject mater areas of interests, groups or areas where conversations and objects related to the subject are shared and conversations around them happen (social objects). In this stage the interactions between people are often echo their connections to people and interests that exist prior to using the services. The information flows are still rather manageable, but start edging into flows with some serious volume and velocity at times, which creates and information density to me dealt with. As the activities increase, particularly across groups and subject matter affinities and needs the need for tools to help with various roles people have (either roles that emerged, take on out or need or adeptness, or are have been assigned) is needed. The roles, other than admin and guide, are still mostly light. The managing of information and connecting it to where it is needed is what surfaces here as activities grow. As time increases and the people participating and activities increase (as expected) things shift to being simple to more complicated given the number and variance of people interacting with each other. Managing connection and what is shared with whom starts to be seen, as does the reality that open social platforms can greatly hinder social interactions (no matter the culture) as the realization that there is something to Robin Dunbar%s [magical] number. As this happens the impact of the organizations overarching culture starts to have an impact and the selection of the tools and services for the social interactions comes in to clarity, whether the right choices were made and implemented to easily integrate with it or clash. The mature social tool stage the complicated realities of human social interactions comes into play, as well as the need for managing and filtering information flows. Most often organizations hit this stage in 6 months to 2 years. The lovely “if information is important it will find you” theory falls from a working practice to myth here as does they never valid 1/9/90 rule. Information and connections with people get lost and fuzzy. Keeping what is needed and valuable near is essential. It is here most often that people managing the services and tools in organizations state, “What they hell did we do? Do we have the right tools and services?” Many times the answer is no they don't have what they need as they didn't see this part of the picture and reality coming. Also they didn't plan budget and resources for this (it was supposed to just work, right). It is also in this stage that it is really clear different parts of the service have matured at vastly different rates. Some of it is individual people maturing at faster rates. The accelerated maturity is not only with individuals but groups, subjects, use patterns, roles, etc. This inconsistency of growth is normal, yet it continually seems to surprise people. The reality is there are various types of people, whom these tools hit a need and map tightly to their activities and perceived way forward. Rarely does accelerated maturity of use have much to do with age (the myth that it is young people who take to these tools really becomes clear here as well). Matching lack of resources and pain because that with other solutions is a much stronger driver when the services ease those pains. The mature social stage is also where the “best practices” considered and possibly used earlier surface as possibly not the best way forward and may have lead to things more problematic than not optimal outcomes. Each organization not only has its own culture, but sub-cultures, but its own ways of doing business on top of the social environment and cultural behaviors. Understanding what the levers and myriad of potential options the possible outcomes that come from their use is an incredibly valuable approach. Combining approaches and methods from these many options will enhance the complications, which needs the ability to have people who can understand and see the components and break down what influences can be attributed to where. It is very much an iterate, test, monitor, and iterate practice all while realizing what doesn't work in one scenario may be brilliant in others. The value from much of the social web understandings derived from what people thought they saw in Web 2.0 offerings runs out and the practice of copying features and functionality from that realm has run its course due to limitations mentioned above. The practices and services are similar, but the massive scale that Web 2.0 services handle has them focussing on volume and quantity of interactions, not the honed qualitative needs in organizations. Facebook doesn't care that people are sharing important knowledge for other to benefit from as long as people are interacting and using their service. Sharing and honing those understandings and being able to refind them as needed in an organization is an essential and has deep value over time. The mature social tool stage is where search is needed to find things and social search (in theory) should work well (that often isn't the case as search for the most part hasn't caught up yet). There is enough content and enough people interacting to see a rich ecosystem ready to see the benefit of these service become really valuable. This can happen, but it becomes difficult. There are no best practices that work here, there are guides and series of “it depends” scenarios and lenses to work through to good (if not hopefully better) outcomes. The number or roles and tools matching those role's needs are needed for many using the service, but at the same time keeping the interfaces easy to use as they were in the earlier stages (think of most role playing games that start with simple interfaces that are easy to use to accomplish what is needed, but over time and proven adeptness at using them more complicated tools and interfaces slowly evolve that match the mastery, roles, and skills needed (Lithium community platform (for outside the firewall) does this amazingly well, but doing this is something that takes incredibly deep skill and understanding). It is also in this stage that information overload really can kick in. Connecting the information and knowledge to people and areas in the system that need it can become a challenge. What seemed to be a reality of a single culture in the organization is seen as more complicated with the multitude of sub-cultures with their own understandings, contexts, terms/vocabularies, and expectations. Not only do non-emergent taxonomies have problems here, but search does if it doesn't account for the social implications and influences underlying the content and needs. By this point the realization that an open social platform didn't work there are now many smaller groups that are fully or partly closed off. The key is to embrace this understanding and work to build synonym repositories and bridges of understanding between the sub-cultures and divergent practice areas. The collective whole that is emerging becomes difficult to work with, but it can be done. The scale and needs that emerge out of this can begin to look like enterprise resource management services, but the components are not as stable and as predictable, they are human and social. Focussing on the complicated components in all of this is a task. It can be done and taking the multitude of complicated steps, conditions, and interactions (software and social, as well as social software interactions) into account and breaking them down into smaller more manageable components through depth of understanding and experience can be done. Having not only a good understanding of broader social network interactions helps greatly, but understandings at the social interaction design level for the much smaller scale interaction needs is essential as well. The interfaces and needs of the service will be drastically different than what is needed earlier in the stages. Even with some mastery of this stage the growth of people and actions over time will shift from being complicated to complex. Hopefully, the complicated needs are being identified and needs relating to the complicated needs are helping to address the issues at hand. Longitudinal understandings of use and patterns is needed to help iterate and meet needs. The complex social system is where things move toward emulating actual social systems in the world around us. Understandings that are central to urban planning and understanding healthy societies at scale, as well as using well worn research and theories for how the complex organisms known as societies interact. (Dave Gray has picked up on this and included it in the Connected Company post, which is worth your time to read.) There are few universal understandings of what people do that will consistently apply. The use and emergent uses of the services that happen in this stage will be quite different and the tools and patterns for managing things that worked in earlier stages will not work as well. External influences (influences outside of the cultures or are emergent and not planned) will impact use and value. Often it is these emergent uses that have the highest value, but they can also be problematic. It is also essential to understand how modifying the whole of the system and service to embrace these emergent patterns will impact. There are no best practices and never will be. It takes identifying and understanding the individual influences (there are often many) and their place in what is occurring in small samples (rarely do large emergent patterns behave or happen consistently across the organization (although it can)) to get better clarity. Knowing this stage is coming and being aware of the patterns indicate this emergent and divergent stage is really helpful as early as the initial planning stages. Indications where and how these patterns are emerging can be seen very early and they can be confused for mainstream use, which changes the whole of the system and skews it against easy considered use in the earlier stages. This isn't something to understand and worry about later, it needs to be something that is firmly in mind with people who not only grasp it, but can ascertain its existence and work through the myriad of considerations that will be needed to work through to best prepare and adapt for it. Tools and services are not exactly here just yet. There are some that could be close, but it all is dependent on need, problems, and the underlying complications that lead to the complexity. There are also many examples for services identifying emergent patterns and behaviors and adapting for them or just letting them be. Things like hashtags in Twitter are an example of embracing the emergent patterns, but it was and is an edge user pattern. This past week Socialcast took the steps to further adapt their system to take hashtag and enable design patterns that helped it be far more usable and understandable to mainstream core users (I think I may know some people who worked on that and bravo all around). There was a kerfuffle a couple weeks back around Delicious when the social bookmarking service Delicious was marked for end of life by Yahoo, which caused a rather large number I know to go rather nuts. Yahoo, has made the claim that they are not shutting the service down, which only seems like a stall tactic, but perhaps they may actually sell it (many accounts from former Yahoo and Delicious teams have pointed out the difficulties in that, as it was ported to Yahoo’s own services and with their own peculiarities). Never the less, this brings-up an important point: Redundancy. One lesson I learned many years ago related to the web (heck, related to any thing digital) is it will fail at some point. Cloud based services are not immune and the network connection to those services is often even more problematic. But, one of the tenants of the Personal InfoCloud is it is where you keep your information across trusted services and devices so you have continual and easy access to that information. Part of ensuring that continual access is ensuring redundancy and backing up. Optimally the redundancy or back-up is a usable service that permits ease of continuing use if one resource is not reachable (those sunny days where there's not a cloud to be seen). Performing regular back-ups of your blog posts and other places you post information is valuable. Another option is a central aggregation point (these are long dreamt of and yet to be really implemented well, this is a long brewing interest with many potential resources and conversations). With regard to Delicious I’ve used redundant services and manually or automatically fed them. I was doing this with Ma.gnol.ia as it was (in part) my redundant social bookmarking service, but I also really liked a lot of its features and functionality (there were great social interaction design elements that were deployed there that were quite brilliant and made the service a real gem). I also used Diigo for a short while, but too many things there drove me crazy and continually broke. A few months back I started using Pinboard, as the private reincarnation of Ma.gnol.ia shut down. I have also used ZooTool, which has more of a visual design community (the community that self-aggregates to a service is an important characteristic to take into account after the viability of the service). Pinboard has been a real gem as it uses the commonly implemented Delicious API (version 1) as its core API, which means most tools and services built on top of Delicious can be relatively easily ported over with just a change to the URL for source. This was similar for Ma.gnol.ia and other services. But, Pinboard also will continually pull in Delicious postings, so works very well for redundancy sake. There are some things I quite like about Pinboard (some things I don’t and will get to them) such as the easy integration from Instapaper (anything you star in Instapaper gets sucked into your Pinboard). Pinboard has a rather good mobile web interface (something I loved about Ma.gnol.ia too). Pinboard was started by co-founders of Delicious and so has solid depth of understanding. Pinboard is also a pay service (based on an incremental one time fee and full archive of pages bookmarked (saves a copy of pages), which is great for its longevity as it has some sort of business model (I don’t have faith in the “underpants - something - profit” model) and it works brilliantly for keeping out spammer (another pain point for me with Diigo). My biggest nit with Pinboard is the space delimited tag terms, which means multi-word tag terms (San Francisco, recent discovery, etc.) are not possible (use of non-alphabetic word delimiters (like underscores, hyphens, and dots) are a really problematic for clarity, easy aggregation with out scripting to disambiguate and assemble relevant related terms, and lack of mainstream user understanding). The lack of easily seeing who is following my shared items, so to find others to potentially follow is something from Delicious I miss. For now I am still feeding Delicious as my primary source, which is naturally pulled into Pinboard with no extra effort (as it should be with many things), but I'm already looking for a redundancy for Pinboard given the questionable state of Delicious. It was clear very quickly that Yahoo is sitting on a real backbone of many things on the web, not the toy product some in Yahoo management seemed to think it was. The value of Delicious to Yahoo seemingly diminished greatly after they themselves were no longer in the search marketplace. Silently confirmed hunches that Delicious was used as fodder to greatly influence search algorithms for highly potential synonyms and related web content that is stored by explicit interest (a much higher value than inferred interest) made Delicious a quite valued property while it ran its own search property. There are a lot of people wondering what to do with all the data that is being generated by social tools/sites around the web and the social tools/services inside organization. Well, the answer is to watch the flows, but the pay off value is not in the flow it is in contextualizing the data into usable information. Sadly, few systems have had the metadata available to provide context for location, conversation flow, relevant objects (nouns), or the ability to deal with the granular social network. How many times have you walked bast a book store and thought, “Hmm, what was that book I was told I should check out?” Or, “my favorite restaurant is book filled, what was the name of the one recommended near here a month or so ago?” When the conversations are digitized in services like Twitter, in Facebook, or the hundreds of other shared services it should be able to come back to you easily. Add in Skype, or IM, which are often captured by the tools and could be pulled into a global context around you, your social connections, the contexts of interest the for the relationships, and the context around the object/subject discussed you should have capability to search to get to this within relatively easy reach. What? I am hearing screaming from the engineers about the computational power needed to do this as well as the latency in this system. Design Engaged 2005 I brought up a similar scenario, within context of my Personal InfoCloud and Local InfoCloud frameworks called Clouds, Space & Black Boxes (a 500kb PDF). The key then as it is still is using location and people to build potential context and preprocess likely queries. When my phone is sharing my location with the social contextual memory parser service that see I am quite near a book store (queue the parsing for shared books, favorited conversations with books, recent wish list additions (as well as older additions), etc. But, it is also at the time I usually eat or pick up food for a meal, so restaurant and food conversations parsed, food blogs favorited (delicious, rated on the blogs, copied into Evernote, or stored in Together or DevonThink on my desktop, etc.) to bring new options or remind of forgotten favorites. Now, if we pull this contextual relevance into play with augmented reality applications we get something that starts bringing Amazon type recommendations and suggestions to play into our life as well as surfacing information “we knew” at some point to our finger tips when we want it and need it. I have been helping many companies think through this inside the firewall to have, “have what we collectively know brought before us to help us work smarter and more efficiently”, as one client said recently. The biggest problem is poor metadata and lack of even semi-structured data from RDFa or microformats. One of the most important metadata pieces is identity, who said what, who shared it, who annotated it, who commented on it, who pointed to it, and what is that person’s relationship to me. Most organizations have not thought to ensure that tiny slice of information is available or captured in their tools or service. Once this tiny bit of information is captured and contextualized the results are dramatic. Services like Connectbeam did this years ago with tags in their social bookmarking tool, but kept it when they extended the ability to add tagging in any service and add context. I am looking forward to being at the Enterprise 2.0 Conference in Boston from June 10 to June 12, 2008. I am going to be presenting on June 10, 2008 at 1pm on After Noah: Making Sense of the Flood (of Information). This presentation looks at what to expect with social bookmarking tools inside an organization as they scale and mature. It also looks at how to manage the growth as well as encourage the growth. Last year at the same Enterprise 2.0 conference I presented on Bottom-up Tagging (the presentation is found at Slideshare, Bottom-up All the Way Down: How Tags Help Businesses Organize, which has had over 8,800 viewing on Slideshare), which was more of a foundation presentation, but many in the audience were already running social bookmarking services in-house or trying them in some manner. This year my presentation is for those with an understanding of what social bookmarking and folksonomy are and are looking for what to expect and how to manage what is happening or will be coming along. I will be covering how to manage heavy growth as well as how to increase adoption so there is heavy usage to manage. I look forward to seeing you there. Please say hello, if you get a chance. One of the things I continually run across talking with organizations deploying social tools inside their organization is the difficultly getting all the components to mesh. Nearly everybody is having or had a tough time with getting employees and partners to engage with the services, but everybody is finding out it is much more than just the tools that are needed to consider. The tools provide the foundation, but once service types and features are sorted out, it get much tougher. I get frustrated (as do many organizations whom I talk with lately) that social tools and services that make up enterprise 2.0, or whatever people want to call it, are far from the end of the need for getting it right. There is great value in these tools and the cost of the tools is much less than previous generations of enterprise (large organization) offerings. The four elements really have to work together to make for a successful services that people will use and continue to use over time. Yes, I am using a venn diagram for the four rings as it helps point out the overlaps and gaps where the implementations can fall short. The overlaps in the diagram is where the interesting things are happening. A year ago I was running into organizations with self proclaimed success with deployments of social tools (blogs, wikis, social bookmarking, forums, etc. ), but as the desire for more than a simple set of blogs (or whichever tool or set of tools was selected) in-house there is a desire for greater use beyond some internal early adopters. This requires paying close attention to the four rings. The first ring is rather obvious, it is the tools. The tools come down to functionality and features that are offered, how they are run (OS, rack mount, other software needed, skills needed to keep them running, etc. ), how the tools are integrated into the organization (authentication, back-up, etc. ), external data services, and the rest of the the usual IT department checklist. The tools get a lot of attention from many analysts and tech evangelists. There is an incredible amount of attention on widgets, feeds, APIs, and elements for user generated contribution. But, the tools do not get you all of the way to a successful implementation. The tools are not a mix and match proposition. One thing that the social software tools from the consumer web have brought is ease of use and simple to understand interfaces. The tools basically get out of the way and bring in more advanced features and functionality as needed. The interface also needs to conform to expectations and understandings inside an organization to handle the flow of interaction. What works for one organization may be difficult for another organization, largely due to the tools and training, and exposure to services outside their organization. Many traditional enterprise tools have been trying to improve the usability and ease of use for their tools over the last 4 to 5 years or so, but those efforts still require massive training and large binders that walk people through the tools. If the people using the tools (not administering the tools need massive amounts of training or large binders for social software the wrong tool has been purchased). Sociality is the area where people manage their sharing of information and their connections to others. Many people make the assumption that social tools focus on everything being shared with everybody, but that is not the reality in organizations. Most organizations have tight boundaries on who can share what with whom, but most of those boundaries get in the way. One of the things I do to help organizations is help them realize what really needs to be private and not shared is often much less than what they regulate. Most people are not really comfortable sharing information with people they do not know, so having comfortable spaces for people to share things is important, but these spaces need to have permeable walls that encourage sharing and opening up when people are sure they are correct with their findings. Sociality also includes the selective groups people belong to in organizations for project work, research, support, etc. that are normal inside organizations to optimize efficiency. But, where things get really difficult is when groups are working on similar tasks that will benefit from horizontal connections and sharing of information. This horizontal sharing (as well as diagonal sharing) is where the real power of social tools come into play as the vertical channels of traditional organization structures largely serve to make organizations inefficient and lacking intelligence. The real challenge for the tools is the capability to surface the information of relevance from selective groups to other selective groups (or share information more easily out) along the way. Most tools are not to this point yet, largely because customers have not been asking for this (it is a need that comes from use over time) and it can be a difficult problem to solve. One prime ingredient for social tool use by people is providing a focus on the people using the tools and their needs for managing the information they share and the information from others that flow through the tool. Far too often the tools focus on the value the user generated content has on the system and information, which lacks the focus of why people use the tools over time. People use tools that provide value to them. The personal sociality elements of whom are they following and sharing things with, managing all contributions and activities they personally made in a tool, ease of tracking information they have interest in, and making modifications are all valuable elements for the tools to incorporate. The social tools are not in place just to serve the organization, they must also serve the people using the tools if adoption and long term use important. Encouraging use and engagement with the tools is an area that all organizations find they have a need for at some point and time. Use of these tools and engagement by people in an organization often does not happen easily. Why? Normally, most of the people in the organization do not have a conceptual framework for what the tools do and the value the individuals will derive. The value they people using the tools will derive needs to be brought to the forefront. People also usually need to have it explained that the tools are as simple as they seem. People also need to be reassured that their voice matters and they are encouraged to share what they know (problems, solutions, and observations). While the egregious actions that happen out on the open web are very rare inside an organization (transparency of who a person is keeps this from happening) there is a need for a community manager and social tool leader. This role highlights how the tools can be used. They are there to help people find value in the tools and provide comfort around understanding how the information is used and how sharing with others is beneficial. Encouraging use takes understanding the tools, interface, sociality, and the organization with its traditions and ways of working. The overlaps in the graphic are where things really start to surface with the value and the need for a holistic view. Where two rings over lap the value is easy to see, but where three rings overlap the missing element or element that is deficient is easier to understand its value. Traditional enterprise offerings have focussed on the tools and interface through usability and personalization. But the tools have always been cumbersome and the interfaces are not easy to use. The combination of the tools and interface are the core capabilities that traditionally get considered. The interface is often quite flexible for modification to meet an organizations needs and desires, but the capabilities for the interface need to be there to be flexible. The interface design and interaction needs people who have depth in understanding the broad social and information needs the new tools require, which is going to be different than the consumer web offerings (many of them are not well thought through and do not warrant copying). Intelligence and business needs are what surface out of the tools capabilities and sociality. Having proper sociality that provides personal tools for managing information flows and sharing with groups as well as everybody as it makes sense to an individual is important. Opening up the sharing as early as possible will help an organization get smarter about itself and within itself. Sociality also include personal use and information management, which far few tools consider. This overlap of tools and sociality is where many tools are needing improvement today. Good interfaces with easy interaction and general ease of use as well as support for encouraging use are where expanding use of the tools takes place, which in turn improves the return on investment. The ease of use and simple interfaces on combined with guidance that provides conceptual understanding of what these tools do as well as providing understanding that eases fears around using the tools (often people are fearful that what they share will be used against them or their job will go away because they shared what they know, rather than they become more valuable to an organization by sharing as they exhibit expertise). Many people are also unsure of tools that are not overly cumbersome and that get out of the way of putting information in to the tools. This needs explanation and encouragement, which is different than in-depth training sessions. The real advantages of social tools come from the combination of getting sociality and encouraging use correct. The sociality component provides the means to interact (or not) as needed. This is provided by the capabilities of the product or products used. This coupled with a person or persons encouraging use that show the value, take away the fears, and provide a common framework for people to think about and use the tools is where social comfort is created. From social comfort people come to rely on the tools and services more as a means to share, connect, and engage with the organization as a whole. The richness of the tools is enabled when these two elements are done well. This section focusses on the graphic and the three-way overlaps (listed by letter: A; B; C; and D). The element missing in the overlap or where that element is deficient is the focus. This overlap has sociality missing. When the tool, interface, and engagement are solid, but sociality is not done well for an organization there may be strong initial use, but use will often stagnate. This happens because the sharing is not done in a manner that provides comfort or the services are missing a personal management space to hold on to a person's own actions. Tracking one's own actions and the relevant activities of others around the personal actions is essential to engaging socially with the tools, people, and organization. Providing comfortable spaces to work with others is essential. One element of comfort is built from know who the others are whom people are working with, see Elements of Social Software and Selective Sociality and Social Villages (particularly the build order of social software elements) to understand the importance. This overlap has tools missing, but has sociality, interface, and encouraging use done well. The tools can be deficient as they may not provide needed functionality, features, or may not scale as needed. Often organizations can grow out of a tool as their needs expand or change as people use the tools need more functionality. I have talked with a few organizations that have used tools that provide simple functionality as blogs, wikis, or social bookmarking tools find that as the use of the tools grows the tools do not keep up with the needs. At times the tools have to be heavily modified to provide functionality or additional elements are needed from a different type of tool. 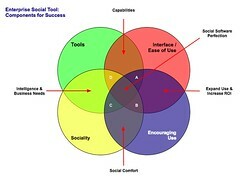 Interface and ease of use is missing, while sociality, tool, and encouraging use are covered well. This is an area where traditional enterprise tools have problems or tools that are built internally often stumble. This scenario often leads to a lot more training or encouraging use. Another downfall is enterprise tools are focussed on having their tools look and interact like consumer social web tools, which often are lacking in solid interaction design and user testing. The use of social tools in-house will often not have broad use of these consumer services so the normal conventions are not understood or are not comfortable. Often the interfaces inside organizations will need to be tested and there many need to be more than one interface and feature set provided for depth of use and match to use perceptions. Also, what works for one organization, subset of an organization, or reviewer/analyst will not work for others. The understanding of an organization along with user testing and evaluation with a cross section of real people will provide the best understanding of compatibility with interface. Interfaces can also take time to take hold and makes sense. Interfaces that focus on ease of use with more advanced capabilities with in reach, as well as being easily modified for look and interactions that are familiar to an organization can help resolve this. Encouraging use and providing people to help ease people's engagement is missing in many organizations. This is a task that is often overlooked. 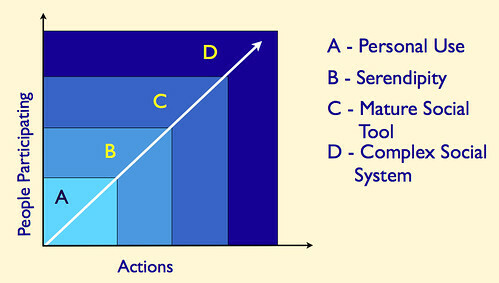 The tools, interface, and proper sociality can all be in place, but not having people to help provide a framework to show the value people get from using the tools, easing concerns, giving examples of uses for different roles and needs, and continually showing people success others in an organization have with the social tool offerings is where many organization find they get stuck. The early adopters in an organization may use the tools as will those with some familiarity with the consumer web social services, but that is often a small percentage of an organization. All of this is still emergent and early, but these trends and highlights are things I am finding common. The two areas that are toughest to get things right are sociality and encouraging use. Sociality is largely dependent on the tools, finding the limitations in the tools takes a fair amount of testing often to find limitations. Encouraging use is more difficult at the moment as there are relatively few people who understand the tools and the context that organizations bring to the tools, which is quite different from the context of the consumer social web tools. I personally only know of a handful or so of people who really grasp this well enough to be hired. Knowing the "it depends moments" is essential and knowing that use is granular as are the needs of the people in the organization. Often there are more than 10 different use personas if not more that are needed for evaluating tools, interface, sociality, and encouraging use (in some organizations it can be over 20). The tools can be simple, but getting this mix right is not simple, yet. One of the things that has been a little bothersome in the last year or two and has been the lack of understanding between the difference between two terms, collaborative and collective. The two terms are rather similar in definition (in some dictionaries they are nearly identical), but the differences between the two terms have a huge difference when it comes to value in social software. This difference and value is often overlooked or missed by those crafting these tools and services, which I hope gets corrected as both have great value and compliment each other. The last year these confusion between the two terms became really frustrating as tools and services were being touted as being collaborative that were only based on collective social interaction. When the Wikipedia entry for folksonomy moved to make the statement that folksonomy is synonymous with collaborative tagging, it deeply bothered me as the term folksonomy was coined to separate tagging done in a collective manner (each individual's contribution is held separate and collected or aggregated to build a fuller understanding, as the tagging is done by and from the individual reading the media for their own retrieval and is also share out with others). Collaborative tagging does take place and there is a need for it in certain situations, but it is not folksonomy. The following mini tutorial should help move the understanding of collective and collaborative forward. I have received much encouragement from academics and social computing researcher and social craftspeople that really need to have the differentiation of these terms brought into clearer light to help move forward the creation of better tools and services. To start this tutorial the understanding of the object that is central to social interaction need to be understood. Often in digital social environments there is a social object that is at the core of the discussion (see Jyri Engestrom's post on Karin Cetina Knorr's "object mediated sociality", which he brings to the web an understanding of social objects). These social objects form the frame of focus for discussion and social interaction, be it a photo in Flickr or a post in a person's blog that is being discussed in the comments or tagged, annotated, or blogged about in another post, much of the social web is built upon social objects or the creation of sociality around objects. These social objects are the focus of this discussion as it is the focus of the discussion and annotation that is being brought into focus here. I am starting with the collective understanding. 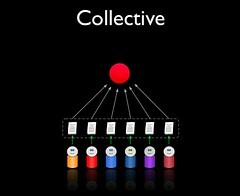 The collective as seen in the first graphic has three layers: 1) the object being discussed; 2) the discussion or annotation of or about the object; 3) the people annotating or discussing the object. The object is the focus of collective, the individual's voices and annotations are held separate as each individual is working as an individual. The individuals annotations and contributions can be aggregated or collected (a helpful connection is the collective is based on collecting) and surfaced as an aggregate. This aggregate is what allows folksonomy, as it surfaced in del.icio.us providing understanding how many people use a single tag term on an object. But, this same approach in folksonomy helps discern slight or vast differences between understanding around an object. We can see what an object may be commonly by many in a folksonomy, but we can also see differences in perspective and context. The deep and rich value in tagging from a folksonomy perspective is created in the collective structure of tagging with the individual voices held separate around the understanding of the individual. The ability for anybody and everybody to tag and annotate and object and have their perspective captured is a very strong value for each individual who has hopes of refinding the object in their own perspective and context, as well as having others whom have similar understanding find the same object. Lacking the understanding of collective approach is lacking the understanding of folksonomy and leave incredible value out of a service as the depth and breadth of understanding supports the human collective mind as it exists. 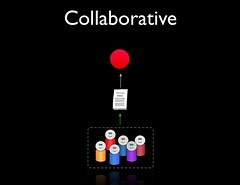 The collaborative understanding has value as it allows for capturing consensus and usually aims at completeness. The collaborative approach has individuals contributing understanding of their perspective of an object, but it done so with everybody working together to build one understanding (often a comprehensive understanding), but often with the aim of the work building the understanding out of one voice capturing many perspectives. The depth and of understanding is flattened - if the object is a picture of a sunset, once it is annotated as being a sunset there is no value in many others making the same statement. Quite often a wiki page on a subject is used as an example of a collaborative effort. Social bookmarking can be collaborative when a group is working to capture all objects on a subject matter and annotate them, but this is rare occurrence. There is a need for this when organizations are doing competitive analysis of other organizations work on a subject matter and the aim is to be as exhaustive as possible. Often the competitive exercises are done in selective social spaces that are closed to all but members of the group doing the work. In the past I have describe Flickr as a narrow folksonomy, which is a rough synonym for collaborative tagging. There is value missing in Flickr tagging (I am always hopeful they will add the collective individual tagging into Flickr as I see great value to the service and the individuals who are tagging other people's photos by being able to tag a photo of a sunset as a sunset, which would all the person tagging to have a nice collection of things they call sunset as well as reinforce it is about a sunset). Flickr does allow for this type of tagging to a degree, but only provides access to the tags by API (Flickr has had many other things on their plate that the community has placed higher priority on). But, the collaborative tagging approach is often copied from Flickr by services that do not have the massive user contribution, which provides Flickr to do insanely brilliant algorithmic understanding of what is in their service (like interestingness and clustering). The understanding of collaboration has trickled out of business and academic understanding of most anything social in an organization being categorized as being collaborative. The aim in the 1990s was for business and organizations to use digital collaboration tools to let people to work together across distance and to capture understanding. At this point most of what was being done was collaborative, with the focus on building one document or deliverable (marketing report and sale projections, etc.). Many of the tools that business used and the academic community in information science studied were tools that were trying to foster collaboration or a collaborative knowledge with in the organization. Today we have grown well beyond the relatively poor tool foisted upon unsuspecting employees as knowledge management tools with the wonderful goal of capturing and sharing knowledge (often through complex tools that created excuses for adding new required form fields) [I have lived through the implementation and non-use of many of these painful KM tools, which did market what is now capable and far less painful in the tools of today]. Today people wanting to hold on to information or a media object can easily bookmark the object in their social bookmarking tool from their own perspective to greatly ease refinding the object later, as well as share that object with others who are near in thought or have similar interests. This collective approach is still being incorrectly called collective through habit of calling anything social collaborative even though the tools that are now delivering on the promise of the last 15 years (which the tools of the past damaged the hope that proper tools could work). Those building tools and implementing tools (I am looking squarely at you large consulting firms who use the old models to mis-understand, provide poor strategy, and improperly implement tools that should work well) must expand their vocabulary and understanding by one term and add collective to their lovely term (when used properly) collaborative.